High off my first Duathlon World Championships (2014) as a member of TeamUSA, I posted “Data Driven Performance.” I shared how my athletic performance transformed as I applied healthcare lessons learned around big data and business intelligence. Over the ensuing two years, I continued to refine and improve based on applied analytics until that fateful Manhattan morning last fall. Running around Battery Park, training for my first sub-90-minute half-marathon, I felt pain radiate in my left knee. Torn meniscus! I was devastated. Being extremely physically active since my youth, I felt significant loss. Competing since I left the womb, I was no longer in the game. Incapable of walking without a crutch, I stumbled for blocks around the Hospital for Special Surgery where I completed my pre-surgical consult. While I was fortunate to have surgery under the knife of one of the world’s best orthopedic docs, I was going to have to start completely over. I dutifully checked into Professional Physical Therapy and pushed my handlers to the edge with my constant begging to let me run and help me get faster than before. I decided to focus on 2017 as my recovery year and to come back strong in 2018. I set some motivational goals related to run-speed, so I was leveraging data a little, but not to the level of the past. I was hitting my time targets for 5K, 10K, and half-marathons. I was logging tons of hours on the bike, but not concerned with wattage or RPMs. I was throwing in some extra weights and cross training while focusing a little on core. I wasn’t entering my data points, but just making sure I was hitting the gym with a good cadence. I stopped measuring precise portions and calories and mixes and potions. I ate when hungry and drank when thirsty. I know my first coach Amari was frowning, but I was putting all the other principles she taught me to work. Yep, I gained a little weight, but everything sure tasted good! I began to enjoy the journey, have more fun and not take all the data too seriously. I began to listen more to my body than to the data points and daily outcome measurements. I started to look forward to my long runs along the Hudson and my four-hour extended indoor simulated cycling drills inside of EJ’s Euless garage. Waking up at four o’dark thirty was no longer a chore. In fact, the alarm merely became a backup to my natural cycle to wake early and enjoy the journey. Almost as a dare from my therapist, I decided to prematurely enter the 2017 TeamUSA National Duathlon (Long Course) Championships in Cary, North Carolina. Just seven months post-op, I took the dive without requisite coaching and data-capturing electronic gizmos. I reasoned that I had little chance to make the team, so I should just race for the love of it. Not to make the team, but just to enjoy the fact that I could train enough to compete so soon after surgery. I loved every minute. The bonus was that I had enough in me to make the team, qualifying to represent our country at the 2018 World Long-Course Duathlon Championships in Switzerland. Nothing like the Alps to test one’s stamina and spirit! Emboldened by the Long-Course Duathlon results, I figured that I might as well take the same approach for the TeamUSA National Duathlon Championships in Bend, Oregon a few days ago. 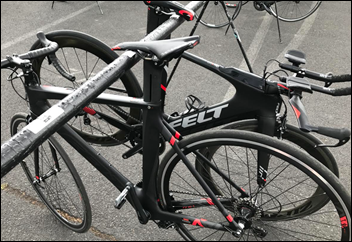 In addition to competing in the Standard-Course Duathlon Championship, I decided to compete the following day in the Sprint-Course Duathlon Championship. Again, I shrugged off the use of my arsenal of data-collecting devices for my body and bike and instead focused on enjoying the moment. I was free to just listen to my body and take in the scenery. My performance was raw and painful, but I ended up securing the last available spots on both teams. In addition, one of my long-time teammates and I became the first athletes to make all three of the TeamUSA Duathlon squads in the same year. No data — just fun and gut. In the final days of training, I thought about my minimalistic data approach and reliance on fun and gut and how that intersects with the workplace. Will we go so far out towards business intelligence, precision medicine, artificial intelligence, and machine learning that we lose emotion? Might we stop listening to our gut and miss an important determinant? Will we listen to feelings or lose empathy? Go through the motions at the cost of emotion? Lose a piece of ourselves and the value of human touch in the healing process? I don’t know. Oh, but what I do know! What I do know is the joy I experienced crossing that finish line, giving all my heart and muscle. Oh, I will never forget the tears I shed embracing my wife when I learned I secured the last and final spot on those national teams! The floodgates opened! Oh, what I also know is the feeling I will have with “Marx” emblazoned below “USA” on my star-spangled uniform at the Standard and Sprint Duathlon World Championships starting gates in Denmark. Would I feel the same high if my accomplishments were due to my obsession with data analytics and my nightly uploads and downloads of each day’s data? I don’t think so. In the end, life requires that we make room for both the motion and the emotion. They aren’t mutually exclusive. What matters is striking the right balance between science and art. When I hit the 2018 World Championships representing our country’s colors, I will certainly be data-driven again, but I will also make plenty of room for the heart and the gut. At the end of the day, it is my soul that crosses the finish line, not a machine, and I will always remain emotional. In our work, we must do the same. Balance the motion and emotion. Enjoy and embrace the intersection of art and science without being blinded solely by science and motion. Never, ever forget the emotion, for that is what makes us human. Ed encourages your interaction by clicking the comments link below. He can be followed on LinkedIn, Facebook, Twitter, or on his web page. But organizations are still run on emotion – they should actually use the data! Blah blah blah. Me me me. I am awesome. I can win even when I don’t try. I hope your just kidding. I understand this sentiment. I think there’s a certain amount of fatigue one feels accumulate over the years when following someone like Ed, who seems to be frequently reinventing himself. I enjoy Ed’s updates and often find inspiration in them, but I can’t help but wonder what ever happened to Marx Family Ministries? We hear about his new family, but what about his previous family that I knew back in Ohio? If the lack of true self-reflection, and I don’t mean the cultivated and polished “self-reflection” presented in CIO unplugged, is a quality of a strong leader and innovator, I will never be a leader of Ed’s caliber and I am glad for it. Marx excellent read, congrats on your accomplishments.